The concept of a hip hinge movement pattern is essential for anyone that moves. This sounds simple, but it can actually be quite difficult to know were your body is in space and to isolate movement to one joint while stabilizing at another joint- especially when you are trying to stabilize a column of many joints (the spine), while only moving at the hip joint. The ability to control a hip hinge movement is extremely important for optimal mechanics during weight training, yoga, running, cycling, daily activities (lifting, bending), and much more. It requires coordination between your core stabilizers and your gluteal musculature, as well as a high level of body awareness and motor control. The inability to dissociate hip movement from spine movement can lead to decreased performance and increased risk for injury. At Endurance Physio, we often teach our athletes/patients this concept before we progress to higher level exercises. Below, are 2 videos that demonstrate how to practice a hip hinge movement (1st video) and how to apply it to a squatting motion (second video). **In the world of olympic weight lifting, the "hip hinge" exercise is generally defined as an exercise where you bend forward with maximal motion at the hip and minimal motion at the knees. This is often also referred to as a deadlift. This is often contrasted by a traditional "squat," which is more focused on maximizing knee flexion and minimizing hip flexion by keeping the chest upright. 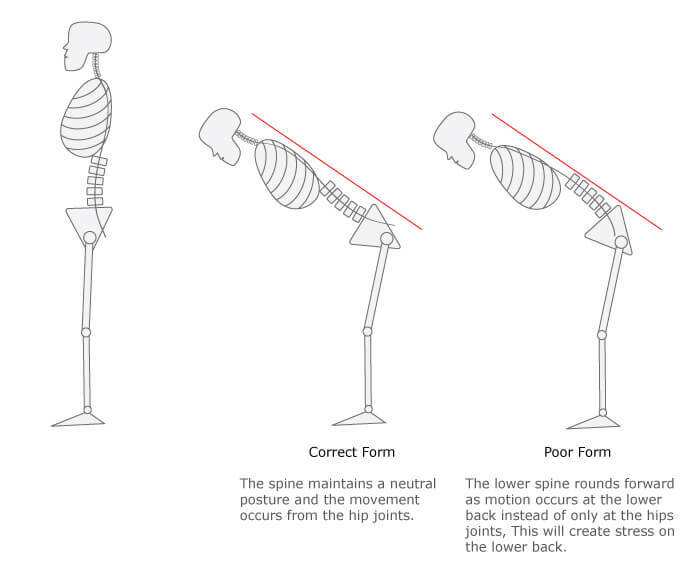 The main difference between a hip hinge and a traditional squat is where the the primary torque occurs. In a hip hinge, the torque is focused at the hip, resulting in the majority of the load at the gluteal and hamstring musculature (posterior chain) as opposed to the quadriceps. In the traditional squat, the torque is primarily at the knee joint with the majority of the load in the quadriceps as opposed to the gluteals. Based on my definition of a hip hinge stated above,"a saggittal plane movement where the hips are the axis of rotation between a neutral lumbopelvic segment and a femur (your thigh)," the concept of hinging at the hip can be applied to either exercise. The idea is that you move at the hip joint without flexing or extending in your spinal segments. A squat can fall on a continuum of the 2 extremes listed above and become more of a hip-dominant exercise that will load the glutes, or a knee dominant exercise that will load the quads. So is one way better than the other? IT DEPENDS! From the point of a physical therapist and injury management/prevention, either way can be more beneficial depending on the individual, the injury, and the goal. For example, if you are cyclist with anterior knee pain and an imbalance where your quads are disproportionately stronger than your glutes and hamstrings, I would recommend working on the hip/glute dominant squat pattern in order to load and strengthen the glutes and decrease load to the knee and quads. However, if you are a skier with relatively weak quads and/or patellar tendinosis, I may recommend a more knee/quad dominant squat in order to progressively load and strengthen the quad muscle and tendon. That said, I more commonly see an issue with quad dominance and posterior chain weakness, so it is more common that I work with individuals on mastering a more glute dominant pattern in order to uptrain the glutes and downtrain the quads. In my opinion, if there does not appear to be an imbalance, a squat should be somewhere in between the 2 extremes so that both the gluteals and the quads are loaded and fatigued. If you have any questions or additional comments regarding this discussion, please feel free to contact me at endurancephysioanya@gmail.com or comment below. Thanks for reading! Older PostPlantar Fasciosis- Why is it happening to me, and why isn't it easier to get rid of?